Pencil drawing of Sehwan (Sind, Pakistan) by George Boyd (1800-1850), dated 25th February 1840. 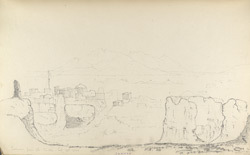 This is one of 95 drawings (90 folios), chiefly of landscapes and monuments in the Deccan, West India and Afghanistan, made between 1821 and 1844. Boyd served in the Bombay Infantry from 1820 to 1850 and was mainly employed in survey work. From 1822 to 1831 he was in the Deccan and Satara; in 1835 he was on survey in Kathiawar; and in 1839 he was making road surveys in Sind. He was mentioned in dispatches during the war in Afghanistan in 1840 and in 1842 he worked on a survey between Quetta and Kalat. Sehwan, formerly known as Siwistan, is thought to be one of the oldest continuously occupied towns in Sind. It is situated in a strategically important position at the head of the Lakhi Pass a traditional route for all invaders to the region. The town is said to have associations with Alexander the Great who occupied the nearby fort known locally as Kafir Qila. In the 4th century AD the town was the capital of the Buddhist ascetic brother of Chandagupta II and was conquered in the 8th century by Muhammad bin Qasim.